We’re excited to announce the launch of a new app for Android devices – VIZpin Firmware Updater . With this app you can you now update VP1 and EZ1 door controllers to the latest firmware at the touch of button. Once downloaded, simply login to view available readers in range and their current firmware versions. Find a reader that you want to update, select the desired firmware version, and click “update” to begin process. 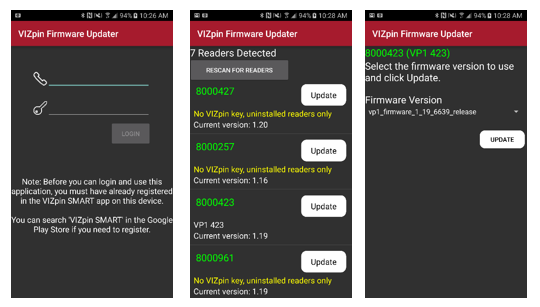 In order to use this application, you must have previously registered the VIZpin SMART app on the same device that you install the VIZpin Firmware Updater app.